Watching from a distance is hard. I’m on the move setting up our big roadshow assault on the fossil fuel industry, but the real action is in Texas, where a growing number of blockaders are trying to shut down work on the southern section of the Keystone Pipeline — and where TransCanada, according to the people at the Tar Sands Blockade, is turning more than a little sadistic. Here’s the story from this morning, as it’s been emerging from a flurry of emails and tweets. (No video — police aren’t letting journalists or observers near the site). There are eight — no, now nine — people in makeshift tree houses in a grove of forest that TransCanada needs to obliterate to push their pipeline through. It’s on private land that was taken with threat of eminent domain, a tactic that the company has used repeatedly to bully landowners from Nebraska to Texas, but despite the protests of everyone from Sierra Clubbers to Tea Partiers, TransCanada is going ahead full bore with construction. Until this morning when, in an effort to protect those tree-sitters, two other protesters locked themselves (one arm each) to the logging equipment. This slowed operations and it angered the police. “A plain-clothes police officer was among the aggressive officers to implement torture tactics. He put [Benjamin] Franklin in a chokehold cutting off his breathing, and bent him over backwards in an attempt to make him pass out. Franklin reports difficulty swallowing because of bruises sustained to his esophagus. “The most physically aggressive was the ranking officer, a Lieutenant with the Wood County Sheriff Department under the observation of TransCanada employees. He twisted and contorted the tube that [Shannon] Bebe and Franklin had locked their arms into, cutting off circulation to their hands and cutting abrasions into their hands and forearms. “Franklin and Bebe then describe pepper spray as the most painful part of their ordeal. Police sprayed into their lockdown tube, and the chemicals burned their already-open wounds. “Fortunately they were able to make it through their mutual torture by intimating personal reassurances to each other. Franklin and Bebe say they were able to endure the pain knowing that they were in it together. 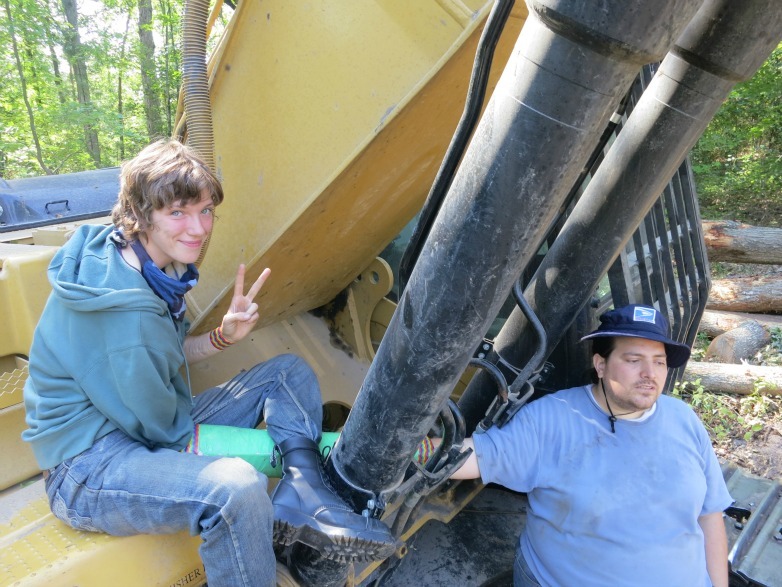 Despite the immense pain our brave blockaders remained locked to the machinery for several hours – determined to stop this toxic tar sands pipeline. This is obviously a lot harder than what any of us underwent in the civil disobedience outside the White House last fall that delayed the northern section of the pipeline a year. In fact, it’s hard to imagine — handcuffing someone and then tasering them? (And on a day when the University of California was forced to pay $1 million to the peaceful protesters they pepper-sprayed at UC Davis last year). But given all the ways that Transcanada has bent the facts and warped our political system in their pursuit of tarsands profit, it maybe stands to reason they’re willing to twist arms too. P.S. If you want to support the protestors down in Texas, they’ve got info about how to help out here.